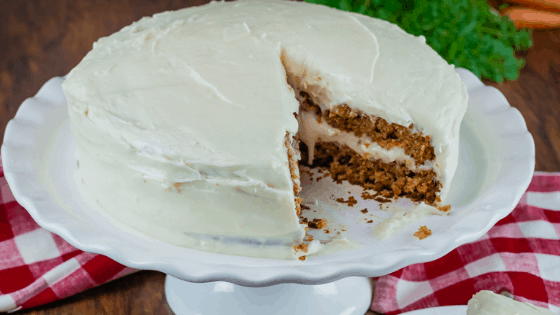 This homemade carrot cake is made with homemade cream cheese frosting. This recipe is a lot like the one my great grandmother used to make. Carrot cake is a classic in my family and is often found at family reunions, Easter, Thanksgiving, and Christmas dinners. Not only is this cake simple to make but it’s packed full of flavor and it’s super moist! There are two ingredients in this cake that makes it super moist and flavorful – crushed pineapples and applesauce. These ingredients really boost the flavor of this cake! This classic cake has homemade cream cheese frosting between the layers and on top. It’s incredibly easy to make this frosting and it pairs perfectly with this carrot cake! This recipe makes enough to fill the layers, cover the top, and it also is enough to frost around the edges. It calls for 12 oz. of cream cheese (1 block and a half) in this recipe and 6 cups of powdered sugar. The addition of milk helps make this frosting creamy, add a little at a time to reach the desired consistency that you prefer in a frosting. Homemade carrot cake with homemade cream cheese frosting. Preheat oven to 350° and grease sides and bottom of 2 8 inch cake pans. I use parchment paper on the bottom. Mix together eggs, oil, applesauce, sugars, vanilla, and drained crushed pineapple. In a separate bowl, mix together the flour, baking soda, baking powder, salt, cinnamon, and nutmeg. Gently stir in the 3 cups of peeled and grated carrots. Making sure not to overbeat. Pour into greased pans and bake for about 30-35 minutes. Check center with a toothpick for doneness. Let cool for about 10 minutes before transferring cakes to wire rack to cool completely before frosting. To make cream cheese frosting, beat the softened cream cheese until smooth. Slowly beat in the powdered sugar, and add 1 to 2 tbsp of milk to reach desired creaminess.